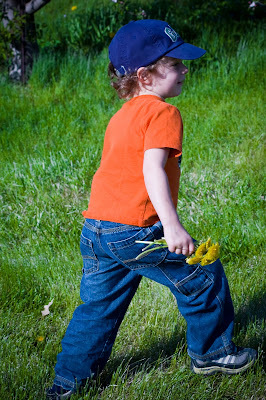 Nothin's better than my boy bringing me a bouquet of dandelions! I LOVE it! People always ask me how I tell the twins apart. And the truth is . . . . their personalities! But you have to stay on top of your game to do it that way. Because they swap personalities every over month or so. What's so fun about Caleb these days is that he's learned to use his eyebrows. And he knows it! So when he's expressing something (especially when Luke has told on him and he's trying to present his closing argument before I judge) he'll hold his mouth just so and raise his eyebrows and wait for the effect to take place. And then when I can no longer hold my smile in, I have to turn away and pretend to cough so I can turn back and look him straight in the face and dole out the appropriate consequence. And then he goes to collect dandelions . . . this is what dreams are made of! All text and photos copyright Jody Robinson 2010. Simple theme. Powered by Blogger.